TOKYO -- Toyota Motor Corp. sidestepped stagnating sales to post double-digit profit increases in the July-September quarter, thanks to advantageous exchange rates and big cost cuts. The company trimmed its full-year sales outlook but it raised its profit and revenue forecasts to new record levels, with the Japanese yen weakening faster than anticipated. Net income jumped 23 percent to 539 billion yen ($4.93 billion) in the company’s fiscal second quarter ended Sept. 30, compared with 438.4 billion yen ($4.01 billion) a year earlier. Operating profit rose 11 percent to 659.2 billion yen ($6.02 billion), from 592 billion yen ($5.41 billion), the company said today in its quarterly earnings announcement. Global revenue grew advanced 4.3 percent to 6.554 trillion yen ($59.90 billion) in the three months, despite vehicle sales holding flat at 2.235 million units from the year before. The robust results underscore Toyota’s continued sensitivity to exchange rates. Like other Japanese automakers, it has benefited this year from the yen’s retreat against other currencies, as the Japanese government pursues an ultra-loose monetary policy in an effort to jumpstart the country’s beleaguered economy. “There was further depreciation of the yen, even more than previously forecast,” Executive Vice President Nobuyori Kodaira said at the company’s earnings news conference. But Kodaira said other factors, including aggressive cost cutting, also contributed to the quarterly profit jump. He said that when Toyota was posting record profits before the global financial crisis, the dollar stood at around 114 yen. Now, Toyota is exceeding those profits with the dollar at only 104 yen, a much less beneficial exchange rate. The company posted major gains in North America. Sales in Toyota’s biggest market advanced 12 percent to 685,000 vehicles, as volume fell in every other region. North America’s regional operating profit rocketed 70 percent to 139.3 billion yen ($1.27 billion) in the quarter, from a year earlier. “The U.S. market is very good,” Kodaira said. U.S. economic fundamentals look good and Toyota has no major worries about demand there, he added. “Going into next year, we expect growth as well,” he said. Toyota’s second-quarter profit surge came despite sales slumps in Japan, Europe and Asia. It was helped by a 40 billion yen ($365.5 million) windfall gain from beneficial exchange rates. The yen tumbled 5 percent in value against the U.S. dollar, and had a similar decline against the euro. The weaker yen increases the yen value of overseas earnings repatriated to Japan and makes Japan exports more competitive internationally. 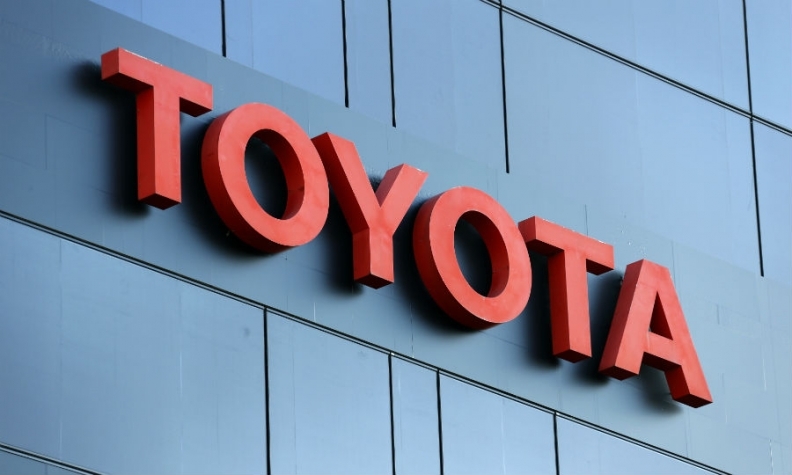 But quarterly earnings were also bolstered by 80 billion yen ($731.1 million) in cost cutting, as President Akio Toyoda continued belt tightening in preparation for massive outlays on the company’s new modularized product development overhaul. Toyota, which kept its title as the world’s biggest automaker in 2013 by selling a record 9.98 million vehicles, has already surpassed pre-financial crisis sales levels. Citing weakening demand in Asia and Japan, however, Toyota trimmed its global sales forecast to 9.05 million vehicles in the current fiscal year ending March 31, 2015. It had earlier projected sales of 9.1 million vehicles. But because of the retreating yen, it also raised its profit forecasts to a second year of record levels and also announced plans for record revenue. The rosy outlook underscores Toyota’s comeback from a string of tough years marred by the company’s first operating loss in seven decades, a worldwide unintentional acceleration recall crisis and the 2011 killer earthquake-tsunami in Japan. Net income is now expected to be 2 trillion yen ($18.28 billion) in the current fiscal year, up from a record 1.823 trillion yen ($16.66 billion) in the year ended March 31, 2014. Operating profit is expected to climb to a record 2.5 trillion yen ($22.85 billion), from the previous all-time high of 2.292 trillion yen ($20.94 billion) booked in the last fiscal year. Finally, revenue is expected to advance to 26.5 trillion ($242.16 billion) this year, just pipping the previous record revenue of 26.289 trillion yen ($240.24 billion) logged in the fiscal year ended March 31, 2008, before the financial crisis.